Size of Male: 45 lbs., 17-18 in. Size of Female: 35 lbs., 17-18 in. 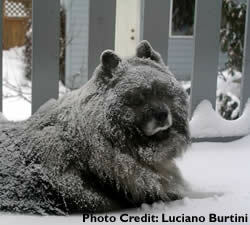 Affectionate and good-natured, the Keeshond is a medium-sized, sturdy dog with an interesting history. They are a spitz breed who became popular as barge dogs in Holland in the 18th century and later became the symbol of a Dutch political party. Today the happy “Kees” love people and other dogs. They are quick learners and have lots of energy. They make excellent pets. Keeshonden (the plural breed name) are descendants of the same arctic spitz dogs as the well-known Samoyed, Norwegian Elkhounds, Finnish Spitz, Pomeranians and even the Chow Chow from China. The Kees became popular as barge dogs in Holland in the 18th century but their fortunes became entwined with the leader of the Dutch Patriot party who had a dog named Kees (which gave the breed his name). Drawings of the dogs appeared everywhere. The party was defeated and the dogs became rare. It was only a century later that the breed was revived around 1920. They were still being used as river dogs by some people at that time and some dogs were gathered so the Dutch Keeshond Club could be formed. Kees are affectionate, outgoing and friendly. They are playful dogs and they learn very quickly. They often excel at agility and obedience. They love children and get along well with other dogs. They can be “velcro” dogs and want to be wherever you are. They make good watchdogs and will bark when necessary. Living Environment – Kees do want to be very close to their owners and they don’t do well as kenneled dogs. They can succeed as apartment dogs if you are willing to make sure they get plenty of daily exercise. Since they do have a dense double coat they can be uncomfortable in hot, humid conditions. Grooming – Kees do want to be very close to their owners and they don?t do well as kenneled dogs. They can succeed as apartment dogs if you are willing to make sure they get plenty of daily exercise. Since they do have a dense double coat they can be uncomfortable in hot, humid conditions. Diet & Exercise – Although this dog breed has normal dietary requirements, they are an active dog and they do need to have plenty of daily exercise. They can become mischievous indoors if they don’t get enough exercise. Health – Kees are considered to be a very healthy breed but they are subject to some problems that can turn up occasionally. Canine hip dysplasia, luxating patellas (slipped kneecaps), epilepsy, Cushing’s disease, primary hyperparathyroidism, canine hypothyroidism, and Von Willebrand’s disease have all occurred in this breed. You should always talk to a breeder about health issues before getting a puppy. The Kees, or Wolfspitz as they are also known, is very intelligent and they are quick learners when it comes to dog training. They enjoy pleasing people and they respond well to positive reinforcement such as praise and rewards. These dogs do very well in dog activities such as obedience and agility. They enjoy doing things with their owners and spending time together.